A couple of months ago, I learned that the New York Times had created a space for trans people to tell our own stories through text, images, and video. This month I decided to share my own story. Being limited to 400 words, I wrote and rewrote, agonizing over every syllable; there was so much more I wanted to say that wouldn’t fit. I even debated how or whether to list my occupation, eventually settling on “Photographer”, as I don’t (yet) consider myself to be a professional writer. I uploaded a photo my partner Ziggy took of me wearing the Kat Blaque T-shirt and matching mug, then submitted and hoped for the best. Yesterday, the New York Times published my story! I was elated. Not a single word was altered. 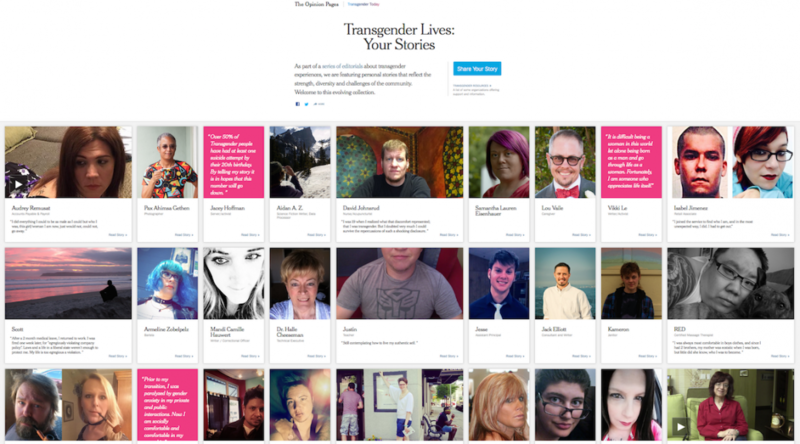 As trans people, it’s crucial that we be given the opportunity to share our own stories. The mainstream media often gets everything wrong: Deadnaming us, ignoring or mocking our pronouns, sensationalizing our bodies. Occasionally a mainstream source will get a story about binary trans people mostly right, but do we really want cis comedians like John Oliver to define the trans experience? The media celebrates those of us who fit into one of the acceptable trans narratives: The trans woman who knew she was a girl from the age of five; the trans man who felt “trapped” in a woman’s body. Many trans people do have these experiences, but many more of us do not, and we are every bit as legitimate in our genders (or lack thereof). Nonbinary people especially suffer from poor representation in the media. There are a lot of mistaken assumptions about nonbinary people, even within the trans community. Explaining and defending our own identities can be exhausting, and this is only compounded by well-meaning allies sharing faulty information that they’ve picked up online. We often ask cis people to educate themselves about us by searching the Internet, so that we’re not constantly forced to be educators. But if the first stories that pop up reinforce the classic trans narrative, that’s not really helping our cause. I’ve found this especially frustrating as a Wikipedia editor on the LGBT studies task force, as published articles about nonbinary people in reliable sources are sorely lacking. We need greater coverage in the mainstream media, and we need to hold reporters to a higher standard of accuracy. I am grateful to the New York Times for providing a prominent space for trans people to tell our own stories, in our own words. I hope that more major publications follow suit.